Whether you are looking for a picturesque outdoor wedding ceremony, rehearsal dinner or private event venue, Village Inn is the perfect location for you! 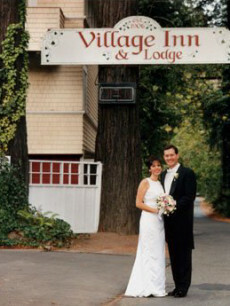 A beautiful, historic building surrounded by coastal redwood trees and overlooking the Russian River, we are located in the quaint, free-spirited and romantic Monte Rio, California. We offer special events including dinners, reunions, luncheons, parties, meetings and club events. Serving as an extension of our main restaurant, our meeting room is perfect for affairs up to 20 guests and our outdoor terrace deck and gazebo can accommodate up to 80 guests. If you would like us to contact you to discuss your planned celebration, please fill in the form below and we will get back to you as quickly as possible. Be assured we will not sell or share your details with anyone else.